It took a few moments for Jerry Traunfeld’s answer to sink in. Not quite two months? Is that really all the time that Poppy‘s been open? The smiling, but clearly tired, chef and owner of this hot new property on Capitol Hill assured me it was true. And he surely would know. I guess that’s one quirk of a restaurant that’s had as much anticipation as this one–from its first twinkle in Jerry’s eye dating to his departure from The Herbfarm in early fall 2007. The name, the location, the demolition/construction of the new space, the menu development…we’ve been along for the ride following all the strides toward this momentous opening. Makes it hard to forget that the just-opened restaurant hasn’t actually been opened longer. In part, it’s because we know we’re in such good hands with Jerry. While the place certainly does deserve the break-in period any other new restaurant does, this chef hits the ground running after such a stellar run at his longtime Herbfarm post. Soft-spoken and low-key despite his high profile and national regard, Jerry seems very much to let his cooking speak for him perhaps more so that other chefs of his caliber. He presents himself with a quiet confidence that plays well on the plate. Or platter, to be more accurate. 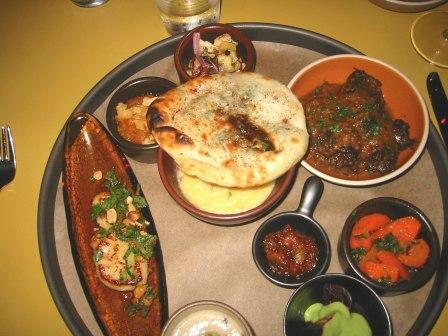 Poppy’s MO follows that of the thali–an Indian presentation of small dishes of different flavors, colors and textures that contrast and complement each other. It’s rather like a tasting menu that you get all at once, so you can bounce back and forth between dishes as so inspired. The selections change daily, each with a theme. It was “a thali for a new puppy” on Friday night (or new rescue dog, as the case may be!). Eight of the ten dishes were set, including celery root pear soup, green goddess beet salad, cilantro naan and cauliflower with apple, dill and currants. The last two dishes–BC scallops with cider sauce and peanuts, and wagyu beef cheeks with toasted nut sauce–could be swapped out, one or both, for leek porcini and chestnut blintz, or chanterelle and sweet potato gratin. Between the four of us we tasted everything and pretty much everything sung strong with amazing flavors, distinctive textures, wonderful variety. And for a flat $32, it was a great value–both in terms of quantity and panache. We were full enough that one scoop of malted milk chocolate ice cream sufficed, deliciously so, for dessert. Our dinner Friday night had started of with cocktails and snacks. To sip, we tried three: the Papi Delicious (a savory take on the margarita, with red bell pepper and jalapeno), the Pearaway (aquavit with belle de brillet pear eau de vie and dry vermouth) and Six Twenty Two (rye with amaro nonino, rhubarb and bitters). All were layered with great flavors, interesting, clever. Alongside we snacked on spice crispies (puffed rice with nuts), eggplant fries with salt and honey and a little delicate tart of leek, taleggio, Asian pear and tarragon. It’s was off to a great start within moments. I love the new-meets-old interior, with the original high brick walls exposed and simple, contemporary furnishings. And Jerry managed to work a small herb garden into the plans, lovely, lush raised beds just outside the back door. You can take the chef out of The Herbfarm, but you clearly can’t take the herb farm out of the chef. Now, his menu may feature plenty of interesting fresh herbs but is also infused with a wider world of culinary influences, more spices, less fanciness, perhaps a little more simple purity at the core of the flavorful fare. Fresh herbs are the norm in so many recipes today, a very happy change from those days when all our herbs were from little tin cans in the kitchen cupboard. That comes thanks both to the availability of fresh herb bundles in grocery stores and more of us home cooks growing chives, thyme and rosemary in our windowsills or patio containers. But one herb seems still relegated to the dry state: the bay leaf. It’s not an herb I’ve ever seen in fresh bundles at the store, and at farmers markets only occasionally, usually then as a nursery plant for the garden. myself a little start in a 4-inch pot a decade or so ago. 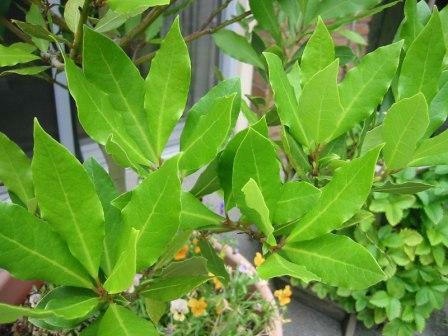 Now the plant’s a few feet tall and keeps me in fresh bay leaves year round. When cooking simple steamed rice, I’ll toss in a bay leaf (torn in a few spots to help release the aromatic flavor) into the boiling water with the rice for a distinct boost in flavor. Added to any stew or soup, you’ll gain a more pronounced flavor with notes of spice, using fresh bay rather than dried. And no chicken goes into the oven around here without a couple bay leaves nestled underneath, a couple more tossed in the cavity. By far one of the most interesting uses I know of for fresh bay leaves is this surprising dessert: bay leaf crème brûlée. This recipe was sent to me by chef Jerry Traunfeld for my very first cookbook, The Northwest Best Places Cookbook , which came out in 1996. Jerry was the longtime chef at the celebrated Herbfarm restaurant, which then was still in its original, more rustic location in Fall City east of Seattle. In fact, it’s because of that recipe (and the testing I needed to do) that I bought that little bay plant at the Herbfarm’s retail herb shop (which they no longer have at their newer Woodinville location). taking over. And for an herb garden at his new restaurant, he just bought a new cultivar of bay, one with interesting wavy leaves. If I can keep a bay plant alive for a dozen-plus years, anyone can. 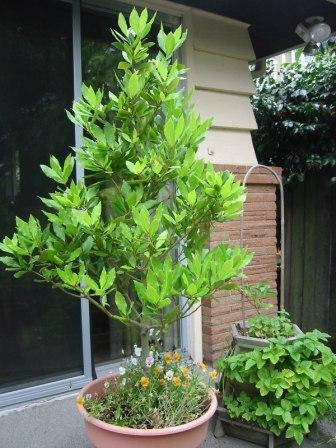 It sits on my patio in that pot year-round, no special treatment, no specific regimen of care. Once you start cooking with fresh bay, you won’t ever want to go back. Bring the milk and cream to a boil in a medium saucepan over medium heat. Coarsely tear the fresh bay leaves and add them to the mixture along with the vanilla bean, if using. Remove the pan from the heat and let steep for 1 hour. Beat the eggs, egg yolks, granulated sugar, vanilla extract (if using), and salt in a large bowl. Whisk in the steeped milk mixture until well blended. Strain the mixture through a fine sieve, discarding the bay leaves and vanilla bean. Pour the custard into eight 3/4-cup ramekins and set them in a shallow pan filled with 1 inch of hot water. Bake the custards until just set but still slightly jiggly, about 40 minutes. Let cool, then chill the custards for several hours or overnight. Just before serving, sprinkle the surface of each custard with the superfine sugar, pouring off any excess. Using a small blow torch , caramelize the sugar just until nicely browned. Serve immediately. * Superfine sugar will melt and caramelize more evenly than regular granulated sugar, but you can use the latter if you wish.